The International League of Peoples’ Struggle (ILPS) Youth Commission conveys its fervent solidarity to the Indian student and youth movement which is currently experiencing heightened attacks from the Prime Minister Narendra Modi government. We condemn the unjust police arrest and detention of Jawaharlal Nehru University (JNU) student council president Kanhaiya Kumar and the ensuing crackdown on students and activists Umar Khalid, Anirban Bhattacharya, Ashutosh Kumar, Anant Prakash Narayan, Riyazul Haq and Rama Naga, for so-called shouting of “anti-national” slogans during a February 9 student event inside the JNU campus, which the government considered as seditious. 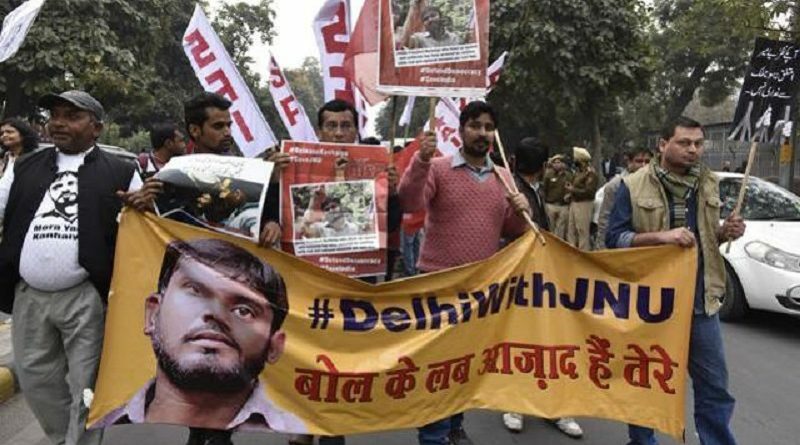 The event during the February 9 program at the JNU student activity is being used by the Modi government to justify the arrest of Kanhaiya Kumar and the filing of colonial-era sedition charges against him, Umar Khalid and fellow JNU students and activists. We likewise condemn the government’s seeming encouragement of “mob-attacks” to Kumar while in police custody and the rising “demonization” of the JNU students which leaves them more vulnerable to physical attacks by ultra-nationalists and pro-Modi mobsters. Labeling these students as “anti-national” and “anti-India” whips up anti-dissent hysteria and creates a chilling effect on different sectors and organizations in India to openly critique the ills of the government and society in general. The recent Modi government’s actions in JNU that stifle academic freedom and dissent come after a series of “witch-hunts” on progressive and vocal critiques of Modi government, which include the arrests and unjust detention of Delhi University’s Professor G.N. Saibaba. What is happening in India also casts light on the growing intolerance in different parts of the world. Day by day, we see the growing global economic depression wrought by the imperialist crisis and political turmoil ensuing from this, fueling more protests and the rising up of the youth, students and people to assert their rights. Student and youth movements rise as a result of neoliberal offensives to education, employment and other democratic rights. The increasing tentacles of political repression are also more and more resorted to by governments to muffle the youth, students and peoples resistance. Running on for several weeks now, the protests in New Delhi and spreading to different campuses in India highlight the growing fascism and untra-nationalism peddled by India’s ruling-clique and against the discrimination and attacks to India’s minorities and dissenters nationwide. We salute the students and youth and various sectors in India for voicing against the Modi government’s systematic actions to curtail freedom of expression, academic freedom and freedom to peaceful assembly. We commend the various teachers organizations and academic unions in JNU and other parts of India for standing alongside the student movement. We reiterate our call and join the international clamor to stop political harrasment and attacks on the student and youth movement in India! Free Kumar and scrap charges hurled against JNU students! Fight political repression and “witch-hunt” in India! Solidarity to the student and youth movement of India!